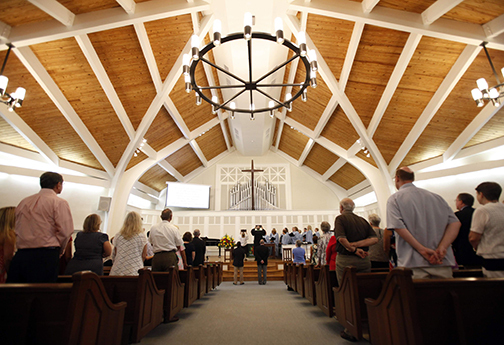 Traditional worship services are held at 8:15 and 10:30 a.m. every Sunday in the Sanctuary. Holy Communion (Eucharist) is celebrated on the first Sunday of each month at both services (in addition to special holy days). Communion is open to all who wish to follow the Lord Jesus Christ. Nursery care and a cry room are available for our youngest attendees. Sunday Worship Times 8:15 a.m. 10:30 a.m.
Hibben’s Contemporary worship service, The Well, takes place in the Christian Life and Learning Center at 10:30 a.m. each Sunday. This time of worship is designed to be open and experiential. A variety of music is offered with a Praise Band providing the primary music. Multi-media and worship arts are used and the atmosphere is warm and casual. Sunday Worship Time 10:30 a.m.